The 22 passionately talented actors of Lilliput Theatre Company will present everyone’s favourite panto scenes in a new Christmas show next week. 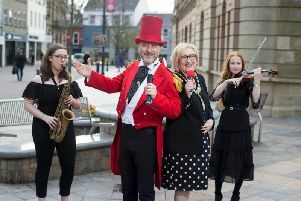 Derry’s foremost theatre company of people with learning disabilities, Lilliput will put their unique stamp on Cinderella, Peter Pan, Snow White and many more! Written and directed by Brian Hasson, ‘Let’s Do Panto’ will come to The Playhouse on Wednesday, December 12 and Thursday 13 at 7pm. Featuring special guests from within the local community, the show includes performances by Oakgrove Primary School choir, singer Emma Murray and dancer Lia Della Friel. “It’s that time of year again when we all look for something that has that “Christmassy feel” to get us in the spirit” Brian Hasson, who is also a care assistant with Lilliput, said. For more information on Lilliput Theatre Company contact Lilliput on 07342061591 or email clare.duddy@westerntrust.hscni.net. Don’t forget Shane Todd is live on stage at teh Derry Theatre on Friday, December 7 at 8pm. Shine, in association with The Galton Agency, presents Shane Todd in Hero. Shane Todd performs stand-up all over the world, has a BBC radio series, supported the legendary Bill Burr and has gained a massive online following with his sketches and character videos. See him in his natural environment, on stage at a comedy show. Tickets £12/£10. To book contact The Box Office on (028)71268027 or www.derryplayhouse.co.uk.